There are some very common myths about Network Marketing/Direct Sales due to some unscrupulous companies, in the last 50 years, giving Network Marketing a very bad name as a business model. This has resulted in lots of negative press over this time. Also, throughout our formative years, we are very much taught that a 9am-5am job is the norm, meaning that the concept of being able to work flexibly for yourself as a network marketer is very much alien to a lot of the population. However, as jobs are becoming less secure these days, Network Marketing is becoming something that is now much more of a consideration for many people as a means of earning an additional income, alongside what they currently do. I decided that I would write this blog in order to dispel some of the misconceptions about Network Marketing/Direct Sales. 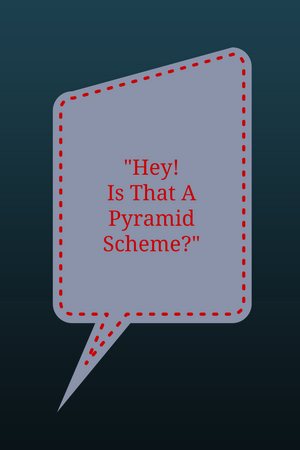 That Must Be A Pyramid Scheme – A pyramid scheme is an unsustainable business model that involves promising participants payments or services, primarily by enrolling other people into the scheme, rather than supplying any real investment. These types of scheme are illegal. The big difference with Network Marketing companies is that they distribute a product. Many network marketing companies are members of the Direct Selling Association (DSA) which regulates the industry which ensures this type of practice cannot happen. It’s A Scam – The answer is no. Network Marketing is strictly regulated by government bodies globally. As with any company you are considering working for you must do your due diligence before deciding to join. When joining a network marketing company there are certain things which make it stand out from other companies: Being in business for over 5 years with a good balance sheet, a good compensation plan, they are a member of the Direct Selling Association, there is no compulsory auto-ship of products. Often when someone has joined a network marketing company and has failed, through lack of commitment, they will describe Network Marketing as “a scam”. Network Marketing Isn’t A Good Business Model – According to the Direct Selling Association in 2013 direct sellers in the UK generated over £2 billion worth of sales and over 400,000 people were involved in the business. This figure shows that network marketing does work. Success with a Network Marketing is not so much about which company you choose to work for but your commitment to work consistently at it over the long term. Network Marketing Are Get Rich Quick Schemes – As with any business, there is no road to riches but, that being said, Network Marketing can provide a good alternative form of income. It is generally only the top 2-5% who make large amounts of money within Network Marketing but these people are ones who have worked consistently at their business over a long period of time, helping others to do the same. However, not everyone joins Network Marketing companies for the big money. Many people join to earn enough so that they can stay at home with their children, earn enough for extra holidays or for a new car/other household luxuries or for an additional retirement income. word-of-mouth advertising so if you were shown a great product at a great price, which you would ordinarily use, most people are pleased to be introduced it and happy to benefit from this saving. The People At The Top Are The Only Ones Who Make Money – This is untrue of Network Marketing companies. This description effectively describes the traditional ‘job’. The person at the top of all traditional companies is the CEO, who always earns the most money. Many people who join a Network Marketing company quickly become despondent when things don’t take off overnight. The same can be said for many new traditional business owners who pay lots of money for a fancy website, but then don’t pay any money out to market their business and wonder why there business fails through lack of sales. If you are committed, tap into the training provided and work at your Network Marketing business consistently, over time, it really can be a really great business to be in. I hope you find this helpful and it would be great hear your comments below. Do come and find me on Facebook and connect. Previous PostWhat is Network Marketing?Next PostSailing is my Passion! Very useful Nicky. I’m on digital catch up mode, so network marketing, affiliate online marketing etc are ideas that often look very much like the old ‘pyramid’ marketing schemes to me. I’ve been asked to be an affiliate for some very dodgy products, and I just apply the rule that if I don’t like the product or think it works, I don’t join. And in fact I don’t belong to any networking marketing groups so far which says I must be a target for some of the poorer products I suppose!!! Great advice Nicky, I love that you point out that network marketing itself isn’t unethical, just the way people choose to market the business is. There are unscrupulous people in all walks of life, not just network marketing.